President Recep Tayyip Erdoğan, speaking to reporters early yesterday on his way back from Moscow where he met with his Russian counterpart Vladimir Putin, said consultations between the two had produced an environment that could facilitate even further cooperation in security, economic and military sectors, arguing that there was significant room for partnership with Russia, especially concerning the developments in Syria. He said discussions on purchasing a missile defense shield from Russia was continuing. "When the missile defense program first came up, Russia, among China, France and the U.S., submitted the most expensive bid. It has discounted the bid considerably over time. There are some who object to us purchasing such a missile defense shield from Russia by citing our NATO membership. However, this is not the correct approach. Greece uses a Russian-made system. Some say it is considering shelving the Russian system. It may well do so. Each country can formulate its own missile defense system the way it serves its interest. If we can't obtain the necessary system from within NATO, we have the right to do what's needed to procure what we want." Erdoğan also argued that the conduct of some NATO allies left a lot to be desired, especially concerning what is happening in Syria and Iraq. "We, unfortunately, saw weapons of our NATO allies in the hands of terrorists. These are heavy weapons, not light arms. We have an obligation to take the necessary precautions to protect ourselves." There have been reports of German arms in the hands of the PKK, which is recognized as a terrorist group by the U.S. and EU. The U.S., meanwhile, has been openly supplying weapons to the PKK's Syrian wing, the People's Protection Units (YPG). "Being a NATO member does not mean we are not independent. We can have close ties with Russia while performing our responsibilities towardNATO. We find objections on this matter inappropriate." He said the meeting with Putin focused on a whole range of topics, including developing cooperation with respect to the Organization of the Black Sea Cooperation, delivering aid to those freed from Daesh occupation in Syria, expanding energy and trade agreements and completing natural gas pipeline and nuclear energy plant projects. Erdoğan was in Moscow on Friday to attend the 6th Economic Cooperation Council meeting between the two countries. "Bilateral trade had reached the $38-billion level before that incident," Erdoğan said in reference to the downing of a Russian jet that violated Turkish airspace on Nov. 24, 2015. "Afterwards, trade volume dropped to about $17 billion. We will now resume our aim to increase bilateral trade to $100 billion." Turkey and Russia had certain requests from each other to further economic ties, Erdoğan said, adding that on most accounts the two sides had reached agreements. One priority is to boost tourism ties, he said, noting that the only Russian concern was related to security. "For us, the security of tourists visiting our country is as important as those of our own citizens. That's why we are doing everything from A to Z to ensure their security and will continue to do so." The studies on the route of the TurkStream Natural Gas Pipeline Project was continuing under the supervision of the Energy Ministry, the president said, adding that the final decision to build the country's first nuclear plant in Akkuyu, Mersin on the Mediterranean Coast by Russians will be taken some time in May. "As many as 259 Turkish employees of the plant are currently being trained in Moscow." Erdoğan said all sides involved in the Syrian war, including the U.S. and the members of the coalition it leads and Iran, should take part in efforts to secure peace. "The point of focus right now is Manbij. If we can get the coalition members on our side and with Russian involvement, we can push out the YPG from the city and allow the return of the locals back to their home." The terrorist PKK's Syrian wing YPG had occupied the city after pushing out Daesh. Turkey has been determined to ensure the YPG, which has been accused of ethnic cleaning and persecution of groups it views as opponents from regions under its control, withdraws to the east of Euphrates. Manbij and other regions under its control west of the Euphrates River are Arab-majority regions. While the U.S. has repeatedly assured Turkey that the YPG will withdraw, no such thing has taken place as yet. "Putin, like us, constantly voices his support for Syria's territorial integrity. He also assured us that Russia would never stand with a terrorist group against Turkey." Erdoğan also said that discussions between Turkish, Russian and American chiefs of staff, who met at İncirlik Air Base last week, could provide the basis of the three countries cooperating against Daesh. He said Turkish and Russian foreign ministers and intelligence officials would also be in touch. When asked about the Russian stance toward the YPG, Erdoğan said, "Putin told me he wasn't warm toward the YPG. He even said they were against a separatist movement in Syria." However, on the issue of the YPG representative office in Moscow, Erdoğan said it was one of the matters discussed but he couldn't say that any progress was made. On former U.S. President Barack Obama's pledge to ensure the YPG withdraws to the east of Euphrates, Erdoğan argued, "Obama did not keep his YPG promise. Americans even told us that the YPG had withdrawn from Manbij. However, it became obvious that they had not withdrawn completely. If the coalition is involved, I believe, Manbij can be rid of both the YPG and Daesh." The local tourism sector, along with vegetable and fruit exporters, suffered considerably due to Russian boycott of goods after the downing of the Russian fighter jet. When asked about the matter, Erdoğan said, "Our aim is to get what he had before. We are not there yet. We discussed our tomato and cucumber exports while they want us to import red meat. We suggested we could satisfy their poultry needs. We hope all these discussions will eventually produce a mutually beneficial outcome. On the agreement to found a Turkish-Russian joint investment fund, Erdoğan said, "We will invest $500 million and so will they. We will use local currencies to initiate this fund, which we believe will considerably alleviate our currency volatility. Turkey is going to the polls on April 16 to vote on a list of constitutional changes that will replace the current parliamentary system with a presidential one. 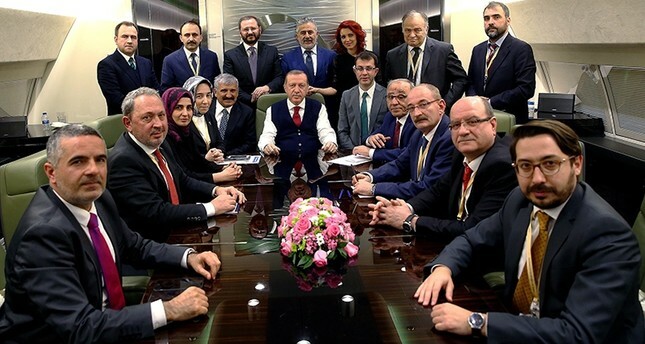 Erdoğan, together with the ruling Justice and Development Party (AK Party) and opposition Nationalist Movement Party (MHP) are supporting the changes. When asked about the likely results, Erdoğan said, "While we can't truly trust the survey as of now, I can clearly say that public support for the changes is increasing." As the electorate becomes more knowledgeable on what the vote involves, the support will increase, Erdoğan argued. "The crucial part is to understand what is proposed. There are 18 separate changes to the Constitution. If the current parliamentary system had been a cure for all, we would not be where we are right now. All of the military coups took place in the parliamentary system. This does not necessarily mean that nothing bad may happen in a presidential system. What's important is which system minimizes such threats." He said the most developed countries were mostly governed by a presidential system, adding that he believed a similar system would allow better, faster and more effective governance in Turkey.